Happy New Year! We've been looking at our top three most popular posts from 2012, and we're at number 1! And the winner is...Measurement Mondays and measuring online marketing. Previously we reshared our third place winner, 10 in 10: Google Chrome, and our second place post, 10 in 10: Google Calendar. Enjoy the end of 2012! A few weeks ago, I shared some basic tips on how to measure your online marketing efforts. Today we’re taking a deeper look at how to measure the effectiveness of your website. Think of your website as your “Open For Business” sign on the web - but unlike your business, your website is open 24/7. So it’s important for you to measure how well your site is achieving your business goals. By using free tools like Google Analytics, you can see how visitors are finding and interacting with your site, which can help you improve your customer experience and potentially drive more sales. Identify your goals and track them correctly: Think about the ultimate business objectives of your website and identify specific visitor actions that indicate success, like finishing a sale, signing up for a newsletter, or viewing an important page. Then set up goal tracking to see how visitors are reaching those goals. You can also assign a dollar value to each goal to see how it’s impacting your bottom line, or set up ecommerce tracking to integrate online sales data. Become a conversion detective: Businesses spend a lot of effort getting people to visit their site, so if your visitors aren’t converting or achieving your goals, it’s important to figure out why. There could be a variety of factors, like too many required steps to request a quote, call-to-action icons that are too small, or poor placement of your email list sign-up button. See what conversion metrics need a boost, and experiment with your site’s content and layout to see what works best. Get to the bottom of your bounce rates: Bounce rates represent the people who are visiting one page on your website and then leaving immediately afterwards. This could signal that they’re not finding what they need right away. Think about what information your customers might be seeking, like contact information or links to promotions, and make sure it’s front and center on your site. Bounce rates can also show you how effective your marketing campaigns are. For instance, if you’re running an email marketing campaign but find that they’re resulting in visits with high bounce rates, you could be wasting time and money. Discover important audience locations: The Internet can introduce even a small town business to potential customers around the world, so you might be surprised at what audiences are most interested in your products or services. Take a look at the countries, regions and provinces where your website visitors are coming from - it just might inspire you to run an ad campaign targeted to reach shoppers in France, or start a special promotion for your fans in Canada. Make the most of mobile traffic: More and more consumers are browsing the web on the go with their smartphones, so spend some time discovering how many of your site’s visitors are coming from a mobile phone. Are they viewing multiple pages, staying for a long time, or bouncing away quickly? A local restaurant might want to know whether mobile visitors are quickly finding information like hours of operation, menus and address - because if they’re not, they could be going elsewhere. If you need help making your website mobile, you can find a ton of resources at www.howtogomo.com to help you get started. There are a lot of things that you can learn when diving into your website analytics, and I know that sometimes it can feel like an overwhelming amount of data. The important thing about measurement is to just get started and keep experimenting. You’ll begin to see what works for your unique site and business, and may even find unexpected areas for growth. Happy measuring! With 2013 around the corner, we’ve collected the top 13 tips for you to get your business ready for the new year. We've been posting one tip each day on the Google+ Your Business page, and previously we shared our first five tips here. Check out our next five tips, and keep an eye out for our last three as we countdown to 2013! 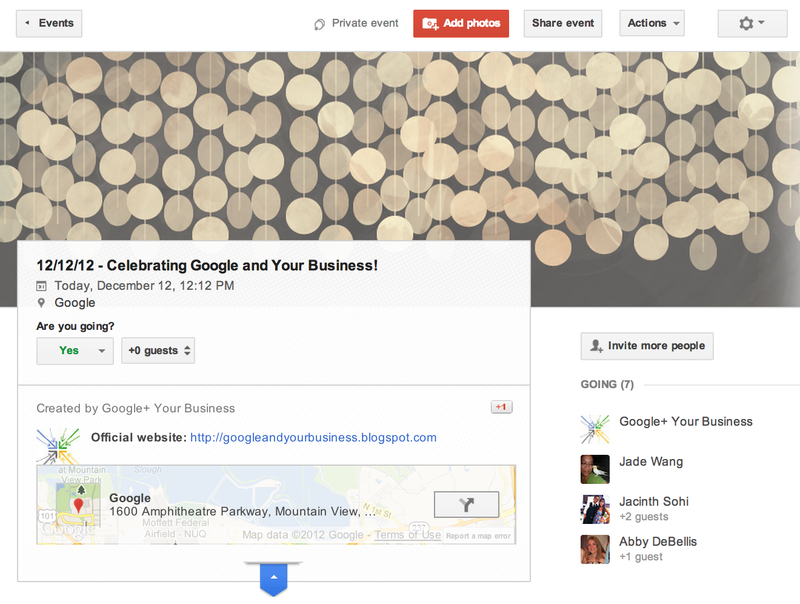 Does your business Google+ Events to host regular events? Now you can easily turn your last sale, customer meet-up, or Hangout on Air into a monthly or quarterly affair by duplicating the event. Open up your last event and select Actions > Duplicate event. Google+ will pull in all the important details, so you don’t have to start from scratch. With Communities, the newest feature in Google+, you and your business can connect with customers and followers in new ways. Search for communities that represent your interests, and see what’s trending in that space. Have a cupcake shop? Join a foodie community and see what’s popular among dessert lovers on Google+. Have a particular interest that you’d like to share? Start your own community! With 2013 around the corner, we’ve collected the top 13 tips for you to get your business ready for the new year. We've been posting one tip each day on the Google+ Your Business page, and we've collected the first five tips here. Start getting your business ready for 2013 now, and stay tuned for the next set of tips! Don't jump straight into your ad that you have running and click to edit that ad. Saving changes to an existing ad causes the ad to go under review which, depending on the number of ads that you have in your account, can cause an interruption in your ad delivery. Instead, we recommend creating a new ad with the holiday promotion in addition to the generic ad that you already have. Once the new ad gets reviewed, you can pause your generic ad and let the holiday one run -- delay avoided! If your business has a website, do you know how your customers are finding it? You can use referrals information in Google Analytics to see how people got to your website. Analytics shows traffic coming from around the web, so not just other websites but from social media as well. Is a lot of your traffic coming from one social media channel? Maybe you want to spend more time posting there. You can also see how many new visits came from a certain source, if you want to target customers by using different content depending on the channel. Does your business receive lots of packages? Don’t worry about wasting time going to multiple websites to track them. You can find out where FedEx, UPS and USPS packages that you've ordered are by typing the tracking number into Google. Simply enter the tracking number into the Google Search box and when you click enter, you'll see updated shipping information for your packages. Our year in review continues, where we're looking at our top three most popular posts from 2012. Last week we reshared our third place winner, 10 in 10: Google Chrome. Coming in second is another piece from our 10 in 10 series, this time our tips for using Google Calendar. The daylight hours are getting shorter, but the work day is as busy as ever. If you use Google Calendar to schedule your business’s days, weeks, and months, check out our tips for organizing and using your calendar more efficiently. The Google Calendar Android app lets you manage all your calendars in one place--including those from your Google accounts and other synced calendars--right from your mobile device. Use keyboard shortcuts to make and manage your events quickly. For example, when you’re on your calendar, try typing c to create a new event, d to display your calendar in day view, or n to see the next date range. 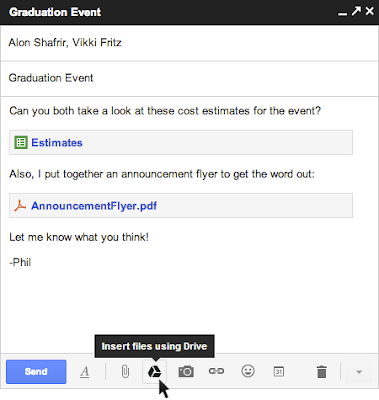 Collaborating on events with co-workers using Google Calendar? Pass on the torch and transfer ownership of the event to the new coordinator. When you're editing event details, visit the "More Actions" dropdown then click “Change owner.” You'll have the option to send them a note letting them know this change is effective now. Unclutter your calendar by auto-hiding events once you've declined them, letting you to focus on the more important parts of your day/week/month. Just click the gear icon at the top of any Google Calendar page, go to Calendar settings, and then the General tab. Select "No" in the “Show events you have declined” section and then save. Tired of the white grid look on your calendar? Add a photo to personalize your background. Planning on meeting with people in another time zone? Enable the world clock in Calendar Labs to find a convenient time. Out of town and not by your computer? You can automatically decline events during times when you’re busy. Check out other Labs features you can try. Create a to-do list that will appear right next to your calendar. You can even assign calendar dates to tasks, and then sort by the due date. Want to share special events happening at your business with your customers? Create a separate calendar and then embed it on your website. Customize your notification settings for events. You can choose to get reminders between 5 minutes and 4 weeks before your event, and pick whether you want the reminder delivered as a pop-up notification, email, or text message. You can also add multiple reminders for an event. Organize your calendar by color-coding different events or calendars and make it easier to get an overview of your schedule with a quick glance. Find even more tips on ways to use Google Calendar by checking out the help center! , small businesses in the US can get an easy-to-build Intuit website, a custom domain name and web hosting. All free for a year. Why not invite that business you know to get online? To get started and send the gift of a free website, go to www.gybo.com/gift where you can find that business and send them a personalized invitation. It’s fast, easy and free. With 97% of internet users looking online for local products and services, it is not a surprise that businesses with an online presence are expected to grow 40% faster. (BCG Report, “The Connected World: The $4.2 Trillion Opportunity,” March 2012) We all want to see our favorite small businesses succeed and getting them online may just be one of the easiest ways to help them grow. Here in the US, 58% of small businesses do not have a website. These business owners could be your uncle, your cousin or your best friend. This holiday season, a website may just be the perfect gift for that small business owner on your list. As part of our Get Your Business Online program, small businesses in the US can get an easy-to-build Intuit website, a custom domain name and web hosting. All free for a year. Why not invite that business you know to get online? To get started and send the gift of a free website, go to www.gybo.com/gift where you can find that business and send them a personalized invitation. It’s fast, easy and free. Leekes is an independent, family-owned business that has been around for 115 years. They operate 5 home department stores throughout the UK, offering quality home furnishings. They recently expanded into Coventry, UK, and wanted to build brand and location awareness. Leekes decided to use Google Business Photos to attract new customers by allowing them to virtually tour their new location. Google Business Photos stitches together HDR panoramic images into a Google Maps Street View-style virtual tour. The 360°-degree panoramic tour offered by Google Business Photos has allowed customers to visit Leekes from the comfort of their own home, tablet or smartphone. A high-quality, smooth interactive tour of Leekes’ interior can easily be found on Google Search, Google Maps and Leekes’ Google+ Local page. Once inside the virtual tour, users can “walk around” and explore the store and its many departments. You can read the Leekes Google Business Photos case study in its entirety here. Get started today at http://www.google.com/adwords/express/.
. From the employee holiday party to your business’s New Year’s sale, check out ways that you can use Events not just to be a party pro, but also to engage your guests before, during, and after your event! Use Google+ to create an event that takes place either offline (such as an event in your store) or online (like a virtual meet and greet with your ownership team). Invite anyone you like. 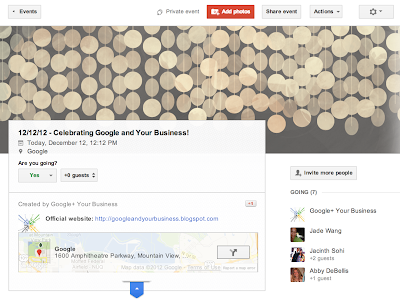 Guests who don’t use Google+ will be able to view and respond to the invitation. Guests who do use Google+ will be able to comment, invite others, and add photos, unless you disable these features. Choose a theme to add flare to your event and represent your business’s personality. Hosting your yearly company party? Having a holiday sale? Choose the theme that best fits your event. Manage your guest list by adding or removing invitees at any time. You can change guests’ rights, such as whether they can comment, add photos, or invite more people to your event by using the Actions menu. Add photos and videos to your event to share a collection of media with your guests before and after an event. By default, all guests can contribute to an event’s photo collection. For public events, anyone can contribute photos. Enable Party Mode so that Android mobile users can automatically upload their photos to the event page while the event is in progress. Add a hangout to your event so you can video chat with customers or co-workers before or during the event. Use Events on mobile for your Android phone to create and moderate your events, share photos and comments, and get directions to events, all while you’re on the go. Make your event public to increase visibility and allow more potential customers to find it and interact with the event’s page. For public events, anyone can say they’re going, add comments and photos, and invite others, unless these settings are disabled. Host an Event on air so that anyone can find and view your event, but the event page itself is more . Events on air have a limited guest list, and only invited guests can add photos and comments (unless this setting is disabled). From the Events homepage, click Find more events to browse public events and get ideas for yours. If you make your event public, others will be able to find your event this way as well. You can add additional information fields to your event, like a link to buy tickets, your business’s website, or a YouTube channel. When you’re creating your event, just click Event Options > Advanced > Show additional fields. To learn more about Google+ events, visit the Help Center! Today, on 12/12/12--the last time this century that the day, month, and year are all the same--we’re bringing you and your business 12 tips on using Google+ Events. From the employee holiday party to your business’s New Year’s sale, check out ways that you can use Events not just to be a party pro, but also to engage your guests before, during, and after your event! Today, we’re offering webmasters a simpler alternative: Data Highlighter. At initial launch, it’s available in English only and for structured data about events, such as concerts, sporting events, exhibitions, shows, and festivals. We’ll make Data Highlighter available for more languages and data types in the months ahead. From time to time we invite guests to post about items of interest and are pleased to have Linzie Venegas join us today. Linzie is head of sales and marketing for Ideal Shield, a manufacturing company in Detroit, Mich. that specializes in bumper post sleeves. Based in a city forged in tradition and steel, Ideal Shield has seen great success on the web—a story Linzie tells us in this post. -Ed. When my great-grandparents moved from Mexico to Detroit in 1917, they were looking for a better life. They had no idea that one day their grandson, my father Frank Venegas, would invent a product and start a business that would help transform their adopted hometown. Thanks to my dad’s hard work and a little help from the web, that’s exactly what Ideal Shield has done. Ideal Shield specializes in manufacturing bumper post sleeves. You may have seen these around—they’re colorful covers that slide over the steel pipes that keep cars from running into buildings. As a young child, my first job at Ideal was to assemble mailers for potential customers. Our mailers were unique—I would place a pack of jelly beans into each envelope. Talk about a great way to get a high “clickthrough rate!” Today, I head sales and marketing for the company, and we’ve taken our family business online with phenomenal results. Ideal Shield’s father-daughter team Frank and Linzie Venegas in the factory surrounded by bumper post sleeves and guard rails. We began using Google AdWords in 2004 to help potential customers find our product because many people didn’t know what it was. We were drawn to AdWords because everyone could see our ads—but we only had to pay for the customers who clicked through to our website. We also found that the leads were very qualified and had a higher close rate than leads from other sources. So far this year, for every $1 we've spent on AdWords we’ve gotten back $22. We’ve been able to have great success—without jelly beans!—using Google AdWords. The energy we’ve put into our online presence has produced tremendous growth for our business; we’ve been able to grow our workforce by 20 percent. We’ve also focused on building our local community of Southwest Detroit. Each year we hire many interns from the local high school, Detroit Cristo Rey, and teach them skills that will last a lifetime. We’ve outfitted the junior and senior classes at Detroit Cristo Rey with Chromebooks so that they’ll have access to the power of the web anywhere, and many teachers there use the free Google Apps for Education suite with their students. This year, we were proud to hear that Detroit Cristo Rey achieved a 100% graduation rate and a 100% college acceptance rate. We also work with the Michigan Minority Business Development Council to teach other small businesses in the community the importance of an online strategy and how the web can help small businesses thrive. My dad started Ideal with himself, my mother and a couple of laborers; today this family business has more than 35 employees and annual sales of $14 million. With help from the web, his hard work, determination and “out of the box” thinking have made Ideal a symbol of strength and renewal in Southwest Detroit. My father has always told me that if you take care of the community, the community will take care of you. Detroit is our community—it’s our heart, it’s our home. We’ve been surprised and delighted at how much the web has contributed to Ideal Shield, and we’re happy to share that success with Detroit. We can’t wait to do more! It's well into December, New Year's Eve is just a few weeks away, and like many others, we're thinking about the year in review. Through the end of the month, we'll re-share your top 3 favorite posts from the Google and Your Business blog in 2012. Coming in at number 3 is a piece from our 10 in 10 series--our top 10 tips for using Google Chrome. While reading online, have you ever seen a word or phrase that you wanted to learn more about? Next time, just highlight the term(s) and then drag it to your tabstrip to the right or left of your current tab--a new tab will open with search results for the highlighted text. You can also try the Dictionary extension so when you highlight a word the definition will hover over it. Have a site (or a few) you always keep open, like Gmail or Rdio? You can pin those tabs so that they open the next time you launch Chrome. To pin a tab, right-click on it then select “Pin Tab”. Sign in to Chrome to access your bookmarks and quickly sync your tabs on any of your other gadgets where you’re signed into Chrome. Just go to the “Other devices” menu when you open a new tab to find them. The back and forward buttons will even work, so you can pick up browsing right where you left off. Want to hide your bookmarks bar? You can also use the keyboard shortcuts Ctrl+Shift+B (Windows and Chrome OS) and ⌘-Shift-B (Mac) to toggle the bar on and off. To save a webpage as a PDF, press Ctrl + p (Mac: Cmd + p) to bring up the print dialogue, then Destination > Change. Need even more space to browse? You can toggle full-screen mode with these handy keyboard shortcuts: Fullscreen Key on a Chromebook, F11 on Windows & Linux, and Cmd+Shift+F on a Mac. Accidentally close a window? Just use the keyboard shortcut Ctrl+Shift+t to open the last tab you closed. Keep using this shortcut to open your previous tabs. Bookmarks are just a click away. Like a page? Click on the Star next to the omnibox, and the page is automatically bookmarked. Use apps from the Chrome Web Store to do things like get notifications, take notes, edit screenshots, and more. You can learn even more tips for using Google Chrome by checking out the help center or Chrome’s Google+ page. H&M -- The retail clothing company, with more than 2 million Google+ followers, uses tailored content, images and video to bring its fashions and lifestyle to life on the platform. They’ve also utilized Ripples to identify their trendsetters and saw a 22% clickthrough rate boost after implementing social extensions in AdWords. Cadbury -- The chocolate maker has reached a following of nearly 3 million users with a combination of creative posts, Hangouts on Air and even the launch of their Dairy Milk Bubbly bar. They’ve also installed the Google+ badge on the company’s web homepage, making it easy as chocolate to follow the brand. Like the ideas here? Log on Thursday to learn more about how to create, capture and sustain demand for your brand using Google+. And if you’re going to miss this while you’re at SMX Social in Las Vegas next week, check back at the webinars page later for a recording of the webinar. Since AdWords Express launched in July 2011 in the United States, we’ve seen businesses from toy stores to tree farms use AdWords Express to get their businesses discovered online. After 16 busy months, AdWords Express has expanded its borders to 12 additional countries and 9 languages, so that gift shops in Germany, heating contractors in the U.K., and surf shops in Australia can get on the map in front of potential customers in time for the holiday season. 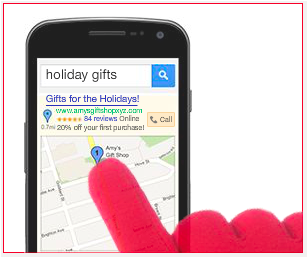 Remember, the sooner you start advertising online, the more holiday customers you can reach and the more free advertising credit you can earn, so visit google.com/adwords/express today. Happy holidays from the AdWords Express team! Since Google Drive launched in April, millions of people have started using Drive to keep, create and share files. Starting today, it’s even easier to share with others: you can insert files from Drive directly into an email without leaving your Gmail. Have you ever tried to attach a file to an email only to find out it's too large to send? Now with Drive, you can insert files up to 10GB -- 400 times larger than what you can send as a traditional attachment. Also, because you’re sending a file stored in the cloud, all your recipients will have access to the same, most-up-to-date version. Like a smart assistant, Gmail will also double-check that your recipients all have access to any files you’re sending. This works like Gmail’s forgotten attachment detector: whenever you send a file from Drive that isn’t shared with everyone, you’ll be prompted with the option to change the file’s sharing settings without leaving your email. It’ll even work with Drive links pasted directly into emails. So whether it’s photos from your recent camping trip, video footage from your brother’s wedding, or a presentation to your boss, all your stuff is easy to find and easy to share with Drive and Gmail. To get started, just click on the Drive icon while you're composing a message. Note that this feature is rolling out over the next few days and is only available with Gmail's new compose experience, so you'll need to opt-in if you haven't already. and tips for creating and editing the documents your business needs. Is your business looking to increase internal collaboration and share files on the web? Below, you’ll find 5 tips on how you can use Google Drive to collaborate on your documents and share them with the right audience. Click on the Share button in the upper right corner of any document to make sure the right people have the right access. By setting the visibility options, you can share your documents with a specific group, anyone with the link, or anyone on the web. To give access to a specific group of people, you can add collaborators and decide if each person should be able to edit, comment on, or just view your files. Transfer ownership of a file or folder to let someone else manage it for you. The new owner can then add or remove collaborators, share the file with others, and change visibility options and access privileges. Download the Google Docs App in Hangouts to open, discuss, and add comments to a document, all while you’re in a Hangout. This way, you can review a file face-to-face in video chat with a co-worker, even if you’re away from the office. Publish your documents and get a URL that you can share with the whole world. Use the publish feature to email your customer base a link to your most recent newsletter or to send a presentation of your business’s most popular products to a potential client. Share files to your Google+ stream publicly or with a specific circle of clients, and let your followers flip through one of your business’s presentations or fill out a feedback form all without ever leaving the stream. For each document you share on Google+, you can set access rights so your audience can edit or simply view it. Looking for even more tips about Google Drive? Check out the Help Center, the Google Apps Learning Center, or Drive’s Google+ page. Editor’s note: In November, we’re sharing tips on how your business can get the most out of Google Drive. Our final post features 5 ways you can share your files. Previously we’ve featured Google Drive basics and tips for creating and editing the documents your business needs. Want a feast this Thanksgiving without crashing into a tryptophan-induced slumber? Work your way through three courses of business tips that we’ve rounded up from our 10 in 10 series. If you want more detail or links to learn even more, check out our full posts on ways your business can use Chrome, Gmail, Google+, and Google Calendar. It’s easy to make a Google Offer right from the Google Places for Business dashboard. Verified business owners already using Google Places for Business, skip on ahead to Create an Offer. Get started on Google Places for Business by entering your business’ phone number here. Ready to create your offer? You can customize whether you want to offer customers a percentage off their sale, a flat amount of money off, or a free item. You’ll also need to know how many offers you want to make available, for how long they’ll run, and a few other details. We’ve got a gallery of photographs, too, to make sure your offer looks great. Your new customers will be able to discover nearby offers on Google Maps for Android. We’ve got some offer management tools, too, so you can see and control the duration of your offer. Offer going well? You can extend the offer, or, limit its availability if needed. You’ll also be able to see how many people have redeemed or are planning on redeeming the offer. Happy savings! Is your business Black Friday ready? After a hearty helping of turkey and lots of sides, folks often have a hankering for some serious shopping. It’s a great time to showcase value and offer some irresistible deals. This year, Google Offers is here to help small businesses run deals and get discovered. Best of all, it’s a deal for you, too. Getting started is free.
. Check back next week for tips on the many ways you can share and collaborate on the documents in your Drive. Businesses looking for pointers on documents, spreadsheets, presentations, and more, keep reading! This week, we’re sharing 5 tips on how you can use Google Drive to create and edit the documents you need to keep your business running smoothly. To create a new document in Google Drive, simply hit the ‘Create’ button to choose which type of file you’d like. To collaborate on your business’s existing documents like Word, Excel, and PowerPoint files, you can upload them to Google Drive for easy editing and sharing. Use a template to create the specific types of documents your business may need, such as letterheads, sales presentations, inventory trackers, or customer feedback forms. Browse the template gallery to find examples best suited for your business. Make your presentations more compelling by embedding YouTube videos into your slides. You can play the video from directly within the file as long as you have an internet connection. View the revision history of your document, spreadsheet, or presentation to see the changes made by you and any other collaborators. You can also revert to earlier versions of a file and see edits made to any of these versions. Use other apps in Drive, such as Forms, Drawings, and Fusion Tables. You can also download third-party apps from the Chrome Web Store that allow you edit images and videos, fax and sign documents, manage products, create flow charts, and more. Editor’s note: In November, we’re sharing tips on how your business can get the most out of Google Drive. Our second post features 5 ways you can create, edit, and enhance your files. 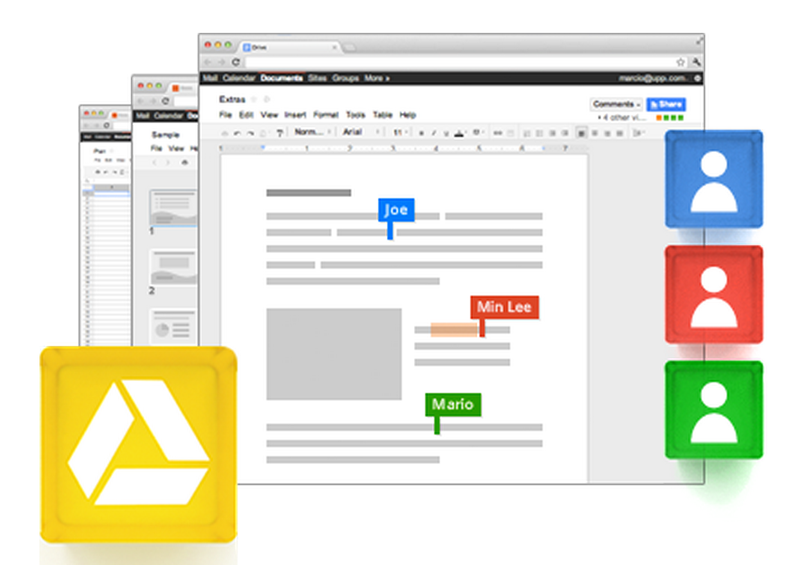 Previously we’ve featured Google Drive basics. Check back next week for tips on the many ways you can share and collaborate on the documents in your Drive. Businesses wanting to streamline their files and folders, look no further. 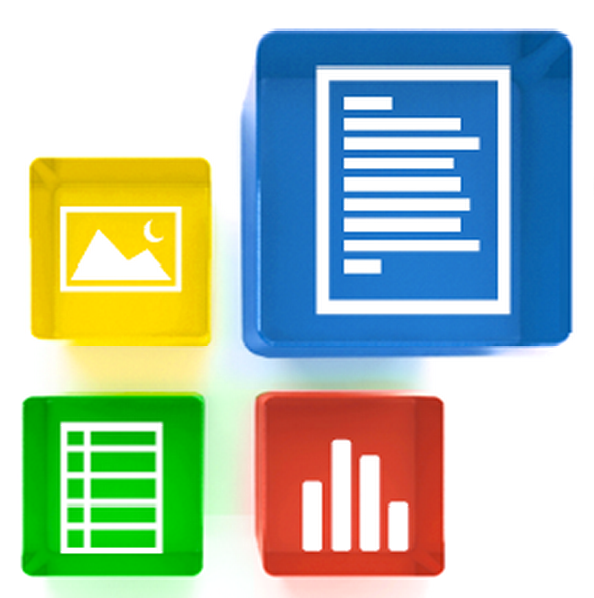 With Google Drive, you can instantly create new documents, spreadsheets, presentations, and more. This week, we’ve got 5 tips on how your business can use Google Drive to store, edit, and share all of your documents. Learn about how you can access your files from anywhere and collaborate with colleagues in real-time. Install Google Drive on your computer to free up space on your hard drive and keep all of your business’s documents in one place. Simply drag and drop all your files and folders into your Google Drive folder to begin syncing items. Any file you sync to your Drive will be accessible on the web via your Google account (in My Drive) as well as on any phone or tablet where you have Drive installed. 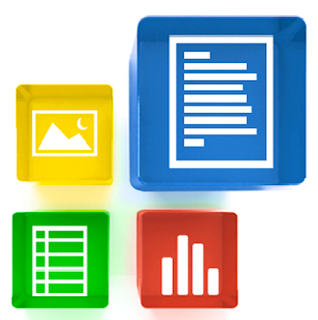 Download the Google Drive app for your Android or Apple device to access your files on the go. Any changes you make on one device are automatically synced with the rest of the places you have Drive installed, as long as you have an internet connection. Use the share feature in Drive to share files or entire folders with anyone. 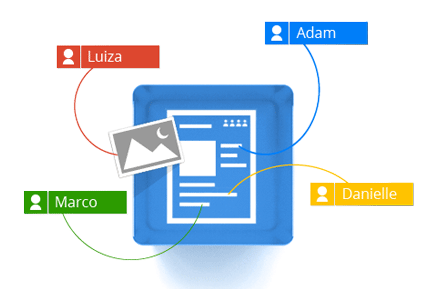 You can share a document with just one co-worker, or make it accessible to an entire group. You can also set editing rights and choose whether others can view, edit, or comment on your stuff. Work simultaneously on the same document with colleagues, and see changes appear as they happen. Use the Comments feature in documents, spreadsheets, and presentations to add notes and discuss content with your collaborators. In documents, you can even chat about a file in real-time. Set up offline access using Chrome, so you can continue working in Google Drive even when your computer isn’t connected to the internet. This way, if you’re on the go and find yourself without wifi, you can still view documents and spreadsheets, move folders around, and make edits to documents. When you reconnect to the internet, your changes will automatically sync to all your devices. To get started with Google Drive, visit drive.google.com/start. Looking for even more tips about Google Drive? Check out the Help Center, the Google Apps Learning Center, or Drive’s Google+ page. Editor’s note: Over the next few weeks, we’ll be sharing tips on how your business can get the most out of Google Drive. This week, learn the basics, and check back for our next posts highlighting some of Drive’s key apps and features. SMB Hangouts on Air: Is My Ad Showing? AdWords Specialists hosted a Hangout on Air yesterday as the first of two installments of the SMB Frequently Asked Questions Hangouts On Air series. During the Hangout, we talked about how you’ll want to use the Ad Preview and Diagnosis tool to see if your ad is running. We also gave you some common reasons why your ad might not be showing: budget, ad rank, location targeting, and approval statuses. And remember to tune in to the live stream of our next Hangout on Air at 11 a.m. PDT, November 15th, when we discuss how to diagnoses causes of performance fluctuation in your AdWords account. In our latest Help Desk Hangout On Air, we chatted with the Get Your Business online team. We talked about how important it is for businesses to have online presences, and the team highlighted a special promotion. U.S. businesses can set up a free website for a year with Get Your Business online with just a Google account. The team also walked us through how businesses can accelerate their online presences after making this website. Miss the event? You can watch the whole thing on the Google and Your Business YouTube channel. What is Get Your Business Online? Get Your Business Online was designed to make it easy, free, and fast to for any business to get online. We think that small businesses are vital for the future, and we want to see small businesses connecting with customers using modern technologies. Get Your Business Online gives small businesses the opportunity to grow through creating an online presence. How can I get my business online? Just visit http://gybo.com in the United States and get started right there. We’re offering a free domain name and hosting for a year, so all you need’s a Google account. You can use the Intuit site builder to make your business’ website, so there’s no HTML knowledge required. Don’t forget to publish your website after building it! Can you share some tips for jumpstarting your online presence? Promote your website: business cards, receipts, etc. Get analytics on your website. Happy Halloween! Has your business done anything special for today? We’ve rounded up some creative ways that businesses have gotten in the spooky spirit using Google+ features to interact with their followers. Using photos: It’s pretty hard not to want a cupcake after looking at these festive photos on Food Network’s Google+ page. Food Network not only shared ideas for decorating desserts, but also a variety of other recipes for Halloween-inspired dishes, all with images. Photos help share your products with customers, especially if you’re in the food business. You can learn more about how to add photos here. Posting videos: Travel Channel shared video clips of its latest episode of Ghost Adventures so followers could get a sneak peek and know when to watch. Videos provide another way to share even more information in an engaging format. Own a boutique? Create a short video showing clothes in your shop and ways to style an outfit. Have an auto repair shop? Post a clip of an interview with a customer sharing a positive experience. Regular posts and sharing content: Scoot & Doodle created a weekly challenge where they asked users to draw their Halloween costumes, design and send Halloween e-cards with “spooky stamps,” and sketch out plans for pumpkin carvings. Regular posts keep your followers coming back to your page, and using hashtags (Scoot & Doodle used #weeklychallenge) makes it easy for others to find related content. Sharing photos, videos, or posts created by your customers also lets them feel more connected to your business. Ask followers questions: Zoo Atlanta posted Halloween-themed animal trivia and shared information on “creepy” animals like tarantulas. Posting questions is a great way to not only interact with your followers, but also to get customers engaged in conversations with other customers. Share promotions: Have a special sale going on at your store? Get the word out by creating a post on Google+. Google Play shared its Halloween sale on its Google+ page to get the word out to even more users. You can even create different circles for your followers and pick who can see your post, so you can share special deals with your most loyal customers. You can learn even more about how to use Google+ by visiting the help center. on November 5th at 10am PT / 1pm ET. Chris will cover tactics for successful social marketing and discuss his new book, “Google+ for Business: How Google's Social Network Changes Everything.” RSVP for the Hangout on the Google+ Event page. Over the next few weeks, we’re offering five opportunities to learn more about Google+ for your business. We kick off with a Learn with Google Hangout on Air with bestselling author +Chris Brogan on November 5th at 10am PT / 1pm ET. Chris will cover tactics for successful social marketing and discuss his new book, “Google+ for Business: How Google's Social Network Changes Everything.” RSVP for the Hangout on the Google+ Event page. Editor's note: This post has been cross-published from the Gmail blog. For more ways on how your business can use Gmail efficiently, check out our Gmail tips post. We're always trying to make Gmail faster and easier to use, so today we're introducing a completely redesigned compose and reply experience that does just that. How many times have you been writing an email and had to reference something in another message? Saving a draft, opening the old email, and then reopening your draft wastes valuable minutes. The new compose pops up in a window, just like chats (only larger). This makes it easy to reference any other emails without ever having to close your draft. You can even do a search or keep an eye on new mail as it comes in. And because the compose window works the same way as chats, you can write multiple messages at once and minimize a message to finish it later. The new compose is designed to let you focus on what's important: your message. The controls are still there when you need them but get out of the way when you don’t. We’ve even added some new features like the ability to easily insert inline images and have more to come. And, when you add recipients to your message, you'll see profile pictures of your contacts in autocomplete helping you find the right person faster. You can also drag and drop the new address chips between to:, cc: and bcc:. When you’re done adding recipients, the address area collapses automatically to get out of your way. You’ll also see these same changes when you respond to a message. The reply experience has been designed to fit better inline as part of your conversation -- replies take up much less vertical height, intelligently expand to fit your content, and always keep the recipients and other controls in view no matter how long your message gets. We're rolling out a preview of the new compose and reply today. After we've added some finishing touches over the coming months, we’ll enable it for everyone. Google AdWords Specialists hosted a Hangout on Air last week as the sixth installment of the SMB Newbie Hangouts on Air series. During the Hangout, we talked about how businesses can expand their video reach by keeping their targeting groups broad and separated by targeting type. We also discussed different video ad formats, which ad formats align with different business goals, and the benefits of linking your YouTube and AdWords accounts. To watch the full 25-minute Hangout on Air or previous topics, visit the Google Business YouTube channel. And remember to tune in to the live stream of our next Hangout on Air at 11 a.m. PDT, Thursday November 8th, when we discuss one of the top issues you talk to us about: what to do when you can’t see your ad. Editor's note: This is our sixth post in a series on SMB Newbie Hangouts on Air, where experts on the AdWords support team are hosting short Hangouts on Air to walk SMBs through AdWords-related topics. Here on the Google and Your Business Blog, we'll be providing a wrap-up of the Hangouts. This particular post is cross-published from the AdWords Google+ page. Businesses getting savvy with social, stay tuned. This week, we’ve got 10 tips on using Google+ for your business, from posts with pizzazz to happening Hangouts. Learn about using features like Circles and Events and pick up some general social media tips, too. Use circles to segment your audience and reach the right people. For example, if you sell sporting equipment, you might have different circles for bicyclists, swimmers, and runners. Add photos, videos, or links to your posts by dragging them directly to the share box. To add a link, drag the icon next to the URL from the address bar to the share box. Share behind-the-scenes photos. You can can edit your photos directly in Google+ and share animated GIF photos--a great way to draw attention to your page. Check out the drop-down arrow at the top of Google+ posts. You can manage the way people interact with your own posts, like disabling comments or editing your post. You can link to, report abuse, or mute other people’s posts. Want to add style to your posts and make them more visually appealing? To add italics, use underscores around your words: _ italics_ → italics. Asterisks make words bold (* bold* → bold), and hyphens will add a strikethrough (- strikethrough - → strikethrough). Create a posting schedule to post at least once a day. Engage your community with questions and +Mention your community so they feel the love and share your post with more people. Try posting at different times of the day to see what best engages your audience. Create an Event to drive foot-traffic to a sale or new product launch, and to drive attendance for your Hangouts. With Events on mobile, guests can RSVP, get directions, and even have their photos and videos uploaded to the Event page if Party Mode is enabled. Host regular Hangouts or Hangouts on Air to have real face-to-face conversations with your followers. Consider behind-the-scenes tours, launch new products in person or simply say thank you to your supporters. Get creative and stay current with your Google+ banner. We’ve seen some delightful use of animation and fun seasonal banners, too, that keep a page fresh and fun. Have your whole team help with the page--add managers by navigating to Pages on the navigation ribbon on the left, hovering over the page, clicking on Managers, and adding more people there. Get even more tips on how your business can use Google+ by checking out the help center or the Google+ Your Business page! Editor’s note: For the 10th month of the year, we’ll be sharing 10 tips each week for using a different Google product. Our final post features 10 ways your business can get the most out of using Google+. Previously we’ve featured tips on Gmail, Chrome, and Calendar. Editor’s note: For the 10th month of the year, we’ll be sharing 10 tips each week for using a different Google product. Our third post features 10 ways your business can use Google Calendar. Previously we’ve featured tips on Gmail and Chrome. When you sign up for call reporting, we will replace the phone number in your Google Search ads across desktop, mobile, and tablet with a toll-free Google forwarding number. When customers call this number, we’ll automatically forward the call to your business and report in your dashboard that the call was made. This allows you to keep track of how many calls your ad is generating for your business. You can see it all right in your AdWords Express dashboard. Okay, I’m in! How can I do this? To edit your call reporting preferences, go to your AdWords Express dashboard. Click the ‘Manage your ads’ tab and you’ll see a checkbox for call reporting. If this is selected, on your dashboard you will see calls in addition to clicks and views for your ad. Currently, call reporting is available for US businesses using AdWords Express. For more information on how it works, set up, and pricing, please visit the AdWords Express Help Center. Editor's note: This article is cross-posted from from the AdWords blog. How did you find us? There's a good reason so many business surveys include this question: understanding how people connect with your business is important. When people search for local businesses on Google, they may want to check out a website, but there's a good chance they'll want to just give you a call. That's why we initially launched call reporting for AdWords customers—to help businesses use search to connect with people over the phone. Now, we're expanding this feature to AdWords Express customers so local businesses can benefit as well. Call reporting allows you to quantify the offline value of your ads by seeing how many phone calls your ads generate. for Business account (or Google+, for the upgraded pages) to make any of the necessary changes to your listing. If you serve customers at their location, we ask that you hide your business’ location on Google Maps. A good test to know if you should be hiding your address: could a customer arrive at your location without an appointment and expect to conduct business? If not, your address should be hidden. If you operate a service area business without a storefront, you must use Google Places to hide your address. Unfortunately, this feature is not yet supported for local pages made in Google+ with social features. If you need to specify where you receive mail within your physical address, put a mailbox or suite number on the second address line. Your address may end up looking reformatted in Google Maps, but it’s important that this information on the second address line in your Google Places for Business dashboard for data processing purposes. There’s no need to put any information other than the address and mailbox number when entering your address. We don’t accept mail-receiving agencies, like P.O. Boxes or UPS Stores, as business locations. Even if your business normally receives mail like this, please input your actual location into Google Places for Business account. If you do not want to show that address (for example, if that is your home address), there is an option to hide your address and instead specify a general area of service in the Google Places for Business dashboard. The location that you list should be staffed by your business during its operating hours. We’re all for keeping your copy fresh, but you should avoid switching 0ut ©hara©ter$. If your listing is in English, keep the letters you use to the standard alphabet, and so on. And remember, please do not include any URLs in your title, unless it’s actually the name of your business. If you manage multiple businesses, remember that you are responsible for keeping all of your listings in compliance with our quality guidelines. These are just some common mistakes we often see with business owners’ listings. Please review our guidelines in detail and make sure your listing is as healthy as it can be and ensure that your prospective customers are finding your relevant listing information. If you have additional questions or concerns, contact our support team under Fix a Problem. We know your business’ presence on Google, Google+ and Google Maps is important to you -- it’s important to us, too. Here are some tips and tricks for keeping those pages healthy. Simply sign in to your Google Places for Business account (or Google+, for the upgraded pages) to make any of the necessary changes to your listing.